Preheat the oven to 170°C and brush the pasties with egg wash. Bake for about 45 minutes. 1To make the pastry, put the flour into a mixing bowl and add the butter and salt. Mix with clean hands until all the butter is well coated. 2Mix in the cold water and bring it together into a dough. 3Chill for an hour and then turn out onto a well-floured work surface, sprinkle flour on top and roll out to a thickness of about 1½ cms. 4Fold over twice (as with puff pastry) and roll out again, fold and refrigerate. 5When chilled, take it out of the fridge and roll out again. If it rolls out smoothly and you can’t see any pieces of butter, you’re in business. 6If not fold and roll out again. 7In the meantime, get on with the filling. 8The chuck needs to be completely denuded of fat, connective tissue etc. 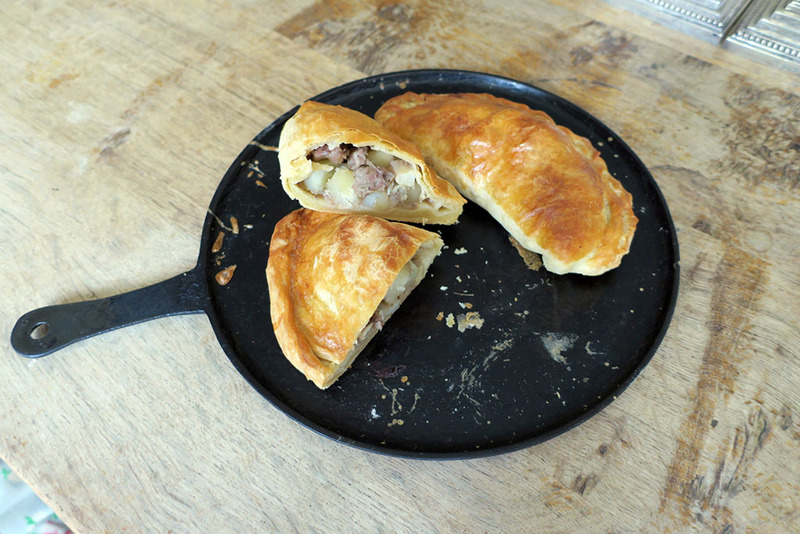 9Normally, that’s where the flavour is but with a proper pasty, the meat gently steams so you really don’t want any chewy bits. 10Cut, across the grain, into thin ribbons about 2cm long. 11Peel and dice the vegetables – swede and potato to 1½cm and onion a little smaller. 12Roll out the pastry on a lightly floured surface to about 3mm thick and cut out in to 20cm circles. 13Assembly is down to you. Traditionally the contents were layered – potato, swede, onion and, finally, the meat but it’s much easier to mix everything together. 14Alternatively mix in the mince and put the steak on top. 15Either way you need that characteristic pepper kick and about a teaspoon of salt. 16Mixing seasoning into damp ingredients is notoriously difficult so season carefully as/if you mix. If you go for the layered method season at the end. 17Divide the filling between the pastry discs, leaving space around the edge. 18Fold over front to back, press down the edges and crimp. The web is awash with American wannabee’s crimping videos – it’s very easy.